Unlock an intuitive and powerful system for managing your donors and supporters, complete will all the features a growing organizations needs to thrive. CommitChange is designed to give you the functionality you need, without the headaches and expense of clunkier systems. You can manage an unlimited number of supporters, create custom fields, group people together with tags, run complex searches, import and export, track offline donations, setup multiple administrators, and much more. Every supporter has their own unique profile, which can include information about their donation history, communications, stewardship, volunteer capacity, demographics, interests and hobbies, event attendance, and fundraising activity. This makes it easy to explore your growing network of supporters and find opportunities to engage them in new and meaningful ways. It doesn’t matter if you have 100 people or 1,000,000 of them — CommitChange can scale to your needs. One distinct advantage is that our system is designed for ease of use and requires little or no training; but if you do need assistance, our dedicated support team will be there to help at a moments notice. 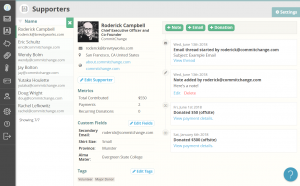 Need to integrate with your existing CRM or donor database? No problem! 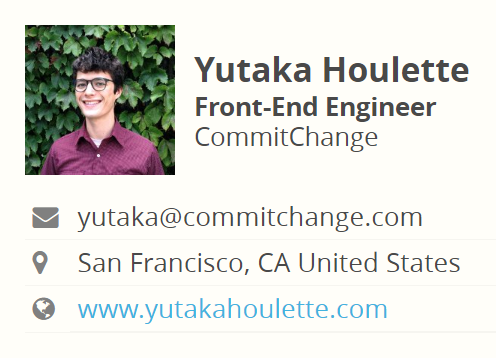 If we don’t already have it, we can build that integration for you or help connect you with a developer who’s willing to do it on your behalf; CommitChange is a flexible and collaborative platform. Get to know your supporters! CommitChange will unlock public information that includes their profile picture, employment information, interests, social media accounts, and an estimate of their reach. This extra layer of information helps you understand who is engaging with your organization, and ways to bring them even closer to your mission. Setting up your account is a quick and painless process; you can either import supporters yourself by uploading a CSV file, or you can send us that information and we’ll be happy to do it for you. Turnaround on data migrations is usually less than 48 hours regardless of how many records you’re importing into CommitChange. We work hard to ensure you have all the information you need to be successful at fundraising.